Marcelo isn’t your typical seventeen-year-old boy. He refers to himself in the third person, is often confused by verbal metaphors, and isn’t crazy about meeting new people. He has “special interests” in religion, classical music, Halflinger ponies and little else. That’s because Marcelo has an Asperger’s-like condition that limits the natural development of his social skills and causes him to be obsessively interested in only a handful of specific topics. Now his father, a high-powered attorney, wants him to take a summer job at his law firm in the mail room so he can learn how the “real world” works. Reluctantly, Marcelo agrees. But from the moment he sets foot in the firm, he is confronted by people and situations that defy the logical way he has always approached life. First there’s Jasmine, the smart and funny head of the mail room whose natural beauty causes Marcelo to feel butterflies in his stomach for the very first time. Then there’s Wendell, the boss’s son whose slick charm keeps Marcelo constantly guessing at his motives. And finally, there’s the picture of the injured girl Marcelo finds at the bottom of an office trash can. Who is she? And was she hurt by the company that Marcelo’s father is defending? By the end of the summer, Marcelo finds himself made much wiser and sadder in the ways of the real world. But also much more hopeful about his survival in it. While this fresh and unaffected novel will be compared to the ground-breaking Curious Incident of the Dog in the Night-Time, it deserves a pedestal all its own for Marcelo’s singular voice and the artfully constructed moral mystery that awakens his awareness of good and evil. The Candide-like Marcelo will leave you viewing your own real world in a whole new light. 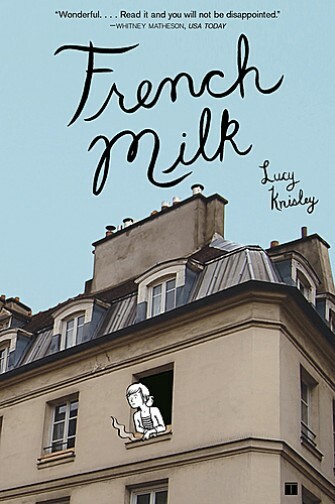 In this charming graphic memoir, twenty-two-year-old artist Lucy Knisley narrates her trip to France with her mother in photographs and drawings. Lucy is about to graduate from college, so her parents spring for the ultimate graduation present—a six week trip in the spring of 2007 to Paris where she and her mother will stay in a rental apartment and sample all the City of Light has to offer. In many ways, this is a typical travel memoir—Lucy lists and draws her everyday experiences, including all the yummy French food she consumes (she estimates having eaten at least 60 croissants and a “metric ton of chocolate mousse” during her stay) and the rich, thick whole French milk she drinks constantly. But what makes this lil’ blue graphic novel special are the very intimate and emotional details of Lucy’s life that are tucked in and around all the sketches of museums and cafes. She unselfconsciously chronicles the fits of depression she falls into when she thinks about leaving the security of school behind, her lusty longings for her boyfriend, and all the times her mother gets on her last nerve. She confesses her doubts that she’ll ever make it as a cartoonist and shares her self-loathing about her “fat American feet” that don’t fit into the sleek European-sized shoes. Lucy is on the scary cusp of adulthood, and even the delights of Paris can’t ease those growing pains. Lucy’s antics will make you chuckle and sigh in recognition, especially if you’re living through that anxious time in your late teens or early twenties. And it was the perfect read for me, as I embark on my own first trip to Paris today! Because of the length of my stay and the jet lag I’m sure to suffer on my return, please don’t expect a new post from me until the end of the month. So au revoir mes amis until then! Sixteen-year-old Brit Laura Brown just wants to rock out with her punk band, the dirty angels. Unfortunately, the environment keeps getting in the way. Due to the violent global warming storms that keep ravaging greater Europe, the England of the near future has decided to lead the way to a greener planet by being the first country to try “carbon rationing.” Everyone is issued their own “carbon card,” a credit card that monitors how much CO2 your personal lifestyle is unleashing on the atmosphere. Pretty much anything that uses electricity or gas causes the emission of carbon dioxide, so suddenly everyone is shivering and walking instead of turning up the thermostat or hopping in the car to run to the store. Laura’s family takes the new rationing especially hard: selfish sis Kim uses up all her points immediately then locks herself in room and refuses to come out, Mom joins a wacky women’s collective that believes in the power of positive thinking, and Dad falls into a drunken downward spiral after being laid off. Laura’s had it with all of them, and is too busy stalking her hot but aloof next door neighbor Ravi to get involved in their personal dramas. But it soon becomes clear that if they don’t learn to pull together, they’ll be torn apart by the blackouts, looting and fuel shortages that are devastating London as a result of the rationing. Like the sassy British cousin of my favorite eco-thriller, Laura’s in-your-face diary describes what it’s like to be a teen at the end of the world as you know it and still feel fine. In spite of the chaos and craziness that surrounds her, Laura still manages to rage, rock, fall in love and keep her head when everyone around her is losing theirs. A timely first novel that unfortunately feels all too real. They say Death never takes a holiday. But he will need to plan for retirement at some point, which is why he decides to set up Death Jr. with an internship at Terminal Industries for the summer. DJ’s not sure what he thinks about this, especially when all his friends, including the charming empty-eye-socketed Pandora, the armless, legless Seep and the brilliant Siamese twins Smith & Weston, are heading off to summer camp. He’s even more disappointed when he discovers that dear old dad intends for him to start from the bottom—the sub-basement bottom. DJ is assigned to work under Mr. Cracy (as in “Bureaucracy”) who is in charge of collecting, collating and filing all the paperwork of the dead. The job is boring, but it keeps DJ out of trouble—until he tries to fill Death’s shoes and finds himself at the center of a corporate take-over, with the bitter Mr. Cracy leading the charge against his dad. Meanwhile, Pandora and Co. are finding that summer camp is not exactly what they expected, and are all too eager to come home and help DJ win back his dad’s job and reputation. This creative re-imagining of Death as a harried suburban dad and his son as just your everyday middle schooler with girl problems was funny and punny in equal measure and sure to please everyone from your bratty little sister to your high school librarian. A spooky treat for all ages! 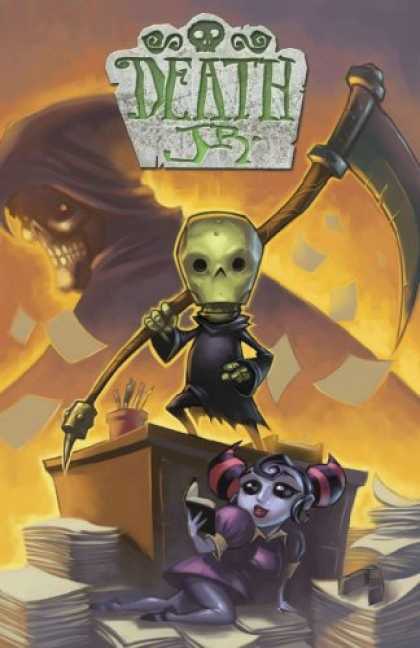 And if the lil’ bonehead makes you chuckle as much as he made me, make sure to go back and check out Death, Jr. (Volume 1).